Dell has just announced the world's thinnest PC laptop, a device which measures just 9.9mm in thickness. The Dell Adamo XPS is the update of last year's Adamo range which boasted a case that was a mere 16.4-millimetres thick, but the XPS shrinks this down even further. The 'Size 0' Adamo XPS weighs a snip under 1.44kg and measures 340 x 273.9mm. Inside its waif-like body is 4GB DDR3 800 memory, an Intel Core 2 Duo (1.4Ghz) ultra-low voltage processor and 128GB solid-state drive. As for the size of the screen, the XPS comes equipped with a 13.4-inch high-definition display. Other features include: a capacitive latching device (one finger swipe opens it up); built-in location awareness; full-size aluminium keyboard; built-in 802.11n wireless; 2x USB 2.0; Ethernet connection (via a dongle) and Windows 7 64-bit edition. Speaking about the Dell Adamo XPS, Alex Gruzen, Senior Vice President of Dell Consumer Products, noted: "Our engineers and designers are breaking new ground and throwing away the old rules with the introduction of Adamo XPS. "We think the Adamo XPS will inspire an emotional connection with anyone who sees it." 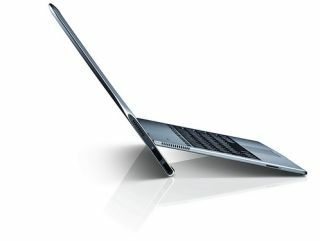 The UK release date and pricing of the XPS is still to be announced, go to www.adamobydell.co.uk for more information.